Throughout the Bible, we are given images of God as the “good shepherd…” and there are great reasons for this. Perhaps the simplest and yet most significant explanation behind this metaphor might be the fact that sheep are actually pretty dumb, and can’t get along without a guide. When it comes down to it, so are we. God created us to depend upon Him and He knows we can’t survive without Him. 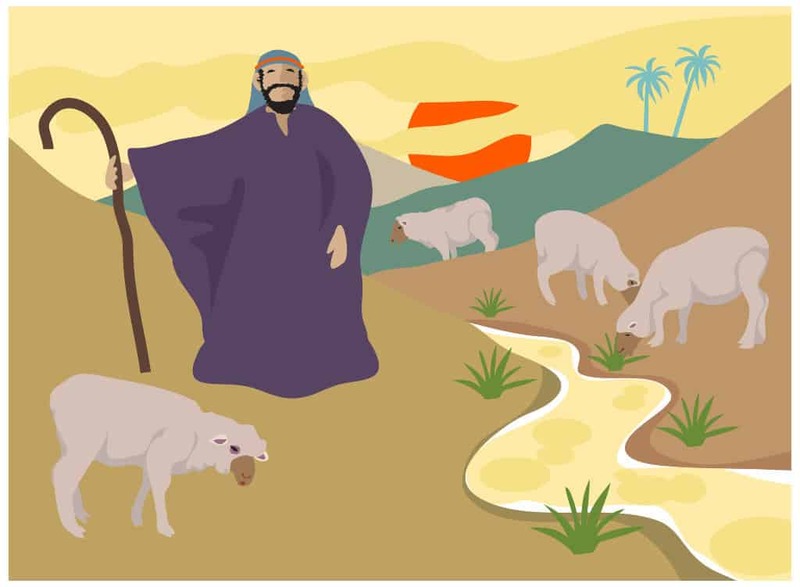 This lesson focuses on an Old Testament passage to emphasize for students the importance of following God as the source of life. Lesson focus: As humans, we easily stray from what is right, but God promises that He loves us and cares for us if we will follow His instruction. Materials Needed: Pictures of shepherds, cotton balls, yarn, dark paper cut-outs, clothespins, markers, scissors, marshmallows, Bibles. Lesson Opening: Which shepherd? Start out with an activity in trust and listening…choose one child to be a blindfolded “sheep,” and select two other children to be a “shepherd” and a distraction. Set up a small obstacle course of sorts and explain that the blindfolded child must make his/her way across the room, listening to the sound of the guiding “shepherd’s voice. However, the other person (or rest of group) will try to distract the “lost sheep” from getting across the room. Play a couple of times to allow multiple “sheep” a turn, if time allows. Additionally, or instead of this activity, you may opt for the classic “hide and go sheep” game wherein cotton balls are scattered throughout the room for students to find. Either way, bring students together and explain that we will be talking today about sheep and shepherds. Ask students what they might know about sheep. Students might be aware that their wool is used to make clothes, or that they like to eat grass, or live in flocks. But there are other characteristics of sheep in general that the Bible uses to compare the animals to us. Sheep are not very smart. They tend to follow the flock and just do what they see other sheep doing. They also like to wander away and are easy targets for predators, without a watchful shepherd to guide and guard them. Sound familiar? Well, the focus of today’s lesson is on a sheep saying from an old testament prophet, who was warning people that they might be easily led astray by the wrong teachers. “‘As for you, my flock, this is what the Sovereign Lord says: I will judge between one sheep and another, and between rams and goats.18 Is it not enough for you to feed on the good pasture? Must you also trample the rest of your pasture with your feet? Is it not enough for you to drink clear water? Must you also muddy the rest with your feet?19 Must my flock feed on what you have trampled and drink what you have muddied with your feet? So what do we have going on here? Who are these “rams and goats” that will be judged, and what have they done wrong? Again, explain to students that there were some leaders in the land at the time who were misleading the people. They claimed to be “shepherds” of Israel but they did not operate with care or true consideration. In fact, they were leading them astray and working only for themselves. God is promising that, while He will care for and love the good sheep, He will also judge and condemn those who are doing wrong. And this is part of what God does. Sometimes He has to punish people. Ezekiel is trying to warn them that this will happen. Interestingly enough, when Jesus came years later, He faced similar problems. The church leaders and priests of His time were trying to tell people things that were not true and lead them astray. But Jesus provides the contrast of being THE Good Shepherd. A shepherd cares for His sheep and takes care of them. Ultimately, “The good shepherd lays down his life for the sheep” (John 10:11). Bring students back to this comforting passage from John, in fact. In ancient times, the shepherds were willing to fight off wolves and lions, brave bad weather, and endure rough terrain in order to guard their wooly charges. We are the little roaming sheep, but if we listen to the Good Shepherd, He will lead us to good pasture. Remember the obstacle course at the beginning of the lesson? The “sheep” really had to listen for the voice of who they knew would lead them. And it was the same for the people of Israel in Ezekiel’s time. They had to know what was right and who to follow. The same applied for Jesus’ time, and the same goes for us, too! Why does the Bible often use sheep as an analogy? How are we like sheep? What does God promise when we obey? Sheep on a string: wrap white yard around a sheep-shaped paper (decorate with color and/or mouth, eyes, etc.). Prior to closing, allow students to make and eat “marshmallow sheep” using marshmallows and pretzels or toothpicks. Close with prayer and thank God for loving us as a Good Shepherd. Ask for wisdom and discernment in listening for His true voice and instructions. Tony Kummer (Editor) reviewed & updated this page on : January 27, 2017 at 10:26 pm. All our content is peer reviewed by our readers, simply leave a comment on any post suggest an update.